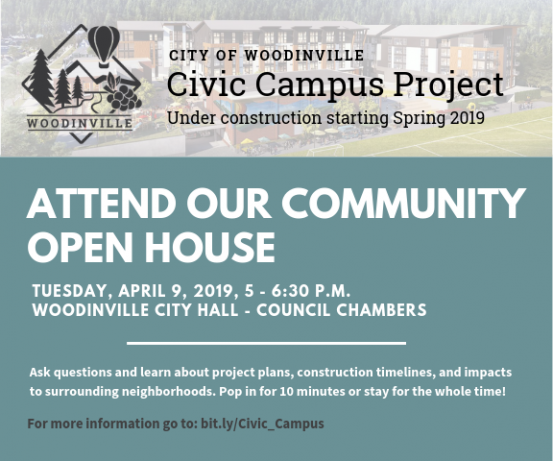 The City of Woodinville is hosting a Community Open House to share information about the Civic Campus Project, which is anticipated to break ground in Spring of 2019. The Open House will be held on Tuesday, April 9, from 5:00 to 6:30 p.m. at Woodinville City Hall- Council Chambers. Residents, business owners, and visitors are invited to attend for all or part of the event to learn about project design, timeline for construction, and impacts to surrounding areas. City staff and representatives from the development group will be available during the Open House to answer questions about the Civic Campus Project and anticipated construction impacts. 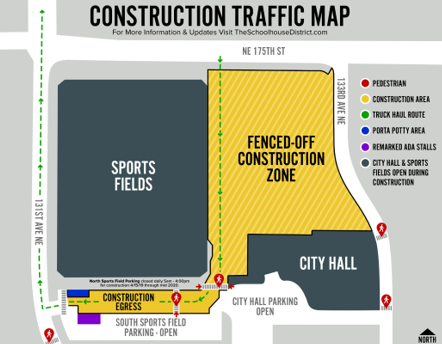 The Construction Traffic Map below shows the location of construction zones and temporary sports field parking. For more information about the Civic Campus Project, visit our project page.